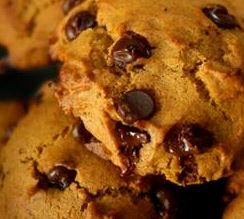 When pumpkin meets dark chocolate…YUM! 1. In a mixing bowl, combine flour, oatmeal, sugars, spices, baking soda and baking powder and salt. 2. Add pumpkin, oil, eggs and vanilla; beat on medium speed until well mixed. 4. Drop by tablespoonfuls onto baking sheets. Bake at 375 degrees F for 13-14 minutes or until edges just begin to brown. Cool for 2 minutes and remove to a wire rack to cool completely. Enjoy! * I use as much organic, all natural, the least refined products that I can easily find and afford. I purchase many of the baking ingredients online and in bulk at the local health food store. I have not found a reasonably priced organic dark chocolate chip, so I currently use Ghiradelli dark chocolate chips.